CMS carries many craft magnets for sale that are perfect for your light-heavier hobbies and crafts. CMS does carry craft magnets wholesale, Retail we have craft magnets bulk pricing too! Creating a magnetic calendar or making a magnetic fun board for the kiddos. You can go to our ideas board on Pinterest to get some magnet craft ideas. Light Duty Craft Magnets may include our ceramic magnets for crafts and perhaps some of our lower powered neodymium magnets. Examples of some of those small magnets for crafts would be sewing smaller magnets into the corner of tea towels to create handy at hand towels for use while cooking. Scrap booking magnets for crafts, small science experiments & rainy day projects to both teach and occupy young one's time. Please keep in mind that none of the magnets especially the neodymium mini magnets may be a choking hazard when handled by children of the age that are prone to placing them in their mouths. In addition neodymium magnets may be a finger pinching hazard when handled as just the magnets. If you place the magnet in a stuffed toy then store those toys on say magnetic strips board they are both safe and fun. Medium projects take Medium Duty Craft Magnets crafts as they require more power than the light crafts. These magnet crafts probably require the mid range neodymium magnets (n40-n48 Grade). Again there are ideas here at our Pinterest site. Hanging tools in the garage magnetic knife holders in the kitchen & if you are so inclined, taking a shot at a perpetual motion machine. 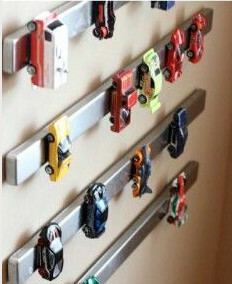 Curtain tiebacks with a couple of magnets, magnetic strips for crafts to hang a child's toy race cars or magnetic strips for magnetic knife holders are all medium power or grade level activities. Anywhere you need small but super strong magnets. Heavy projects need the ultimate heft that Heavy Duty Craft Magnets provide and these are exactly that. They include super strong magnets that require more brute magnetic strength than the above. 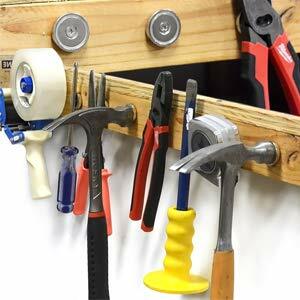 maybe magnetic strips to hold things like hammers to the wall. Using some of our hobby magnets for magnet fishing (we have a magnet that will hold 405 lbs), hanging larger tools in the garage, holding pieces of metal that you are planning to weld together, a woodworking table holding blocks for a jig to implanted metal magnetic strips, industrial sculpture & maybe holding seasonal speaker set for music out by the pool. There are just so many things around the house shop and school that you can use these super strong magnets for and it is only limited by your imagination. 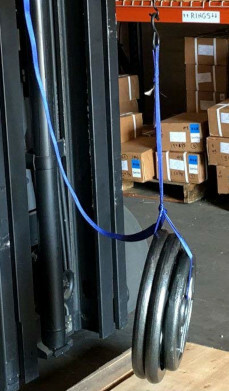 Maybe you need to hang 110 lbs of weights from a forklift...well maybe someday. Neodymium Magnet Bar N45 4"x1/2"x1/2"